Abstract: The purpose of this work is to propose a strategy for managing and applying software quality in the classroom and in small business projects, and to develop an automated tool which will assist in implementing this strategy. Nowadays, there are various types of software applications used to assist in software development processes. However, these software products are generally designed for large-scale projects and experienced software developers. They are not well-suited to accommodate the special needs of small-scale projects and students, or practitioners who are learning how to develop software. Despite the difficulties associated with the overhead in implementing sound software development practices, a modality for incorporating aspects like software quality and iterative development into software development practices is warranted. This work proposes such a modality. The modality is targeted towards students and small-business environments in which practitioners have the same traits as students (which is often the case for small business in-house development). The two common traits which govern the modality are 1) target users are not experienced developers and 2) involvement in the software development project is not a primary activity for target users. 4. 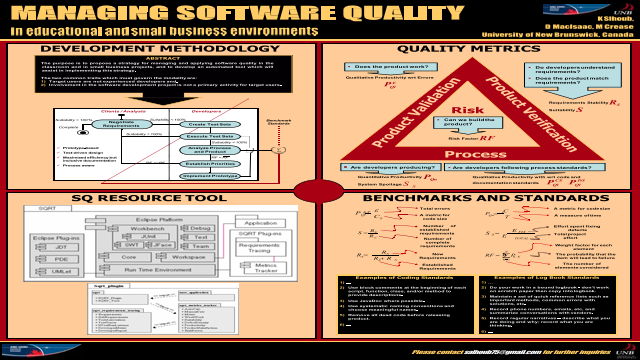 Software Quality Resource Tool (SQRT): a semi-automated resource tool designed to assist small-scale developers attend to quality in their software products Summary: The purpose is to propose a strategy for managing and applying software quality in the classroom and in small business projects, and to develop an automated tool which will assist in implementing this strategy.